Schofield Barracks, Hawaii (July 20, 2004) — Marines, assigned to 3rd Battalion, 3rd Marine Regiment, India Company, prepare to move in on a city occupied by opposition forces. 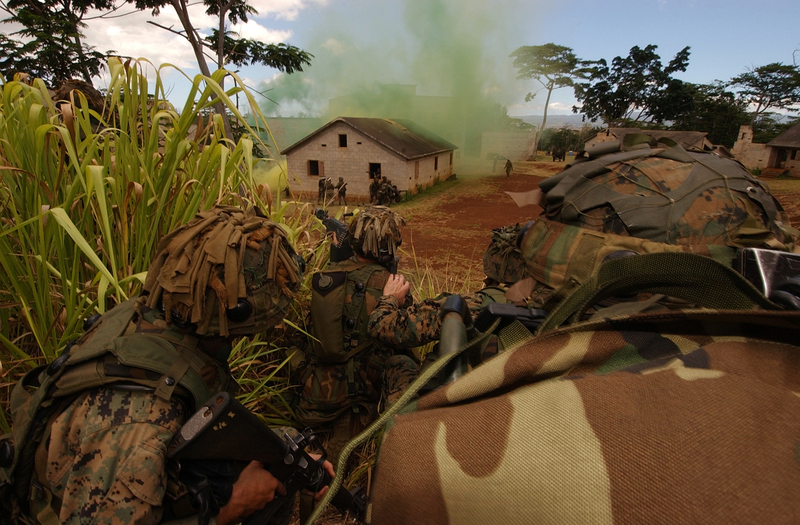 The Marines are participating in a Military Operations on Urbanized Terrain (MOUT) training evolution in support of exercise Rim of the Pacific (RIMPAC) 2004. RIMPAC is the largest international maritime exercise in the waters around the Hawaiian Islands. This year’s exercise includes seven participating nations; Australia, Canada, Chile, Japan, South Korea, the United Kingdom and the United States. RIMPAC is intended to enhance the tactical proficiency of participating units in a wide array of combined operations at sea, while enhancing stability in the Pacific Rim region. U.S. Navy Photo by Photographer’s Mate 2nd Class Richard J. Brunson.